SAS871 is ideally suited to rear applications in saloon style racing such as GT Racing. P.Mu Racing SAS Racing pads have become dominant in Endurance racing in recent times. 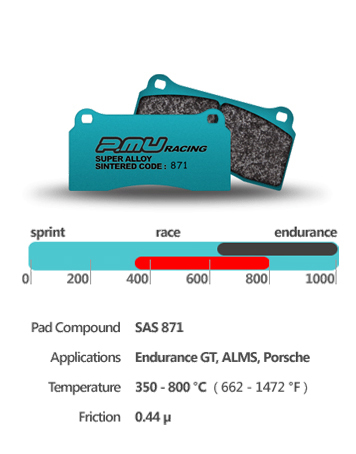 P.Mu SAS pads are a sintered compound and are used in applications where teams can benefit from no pad changes during endurance format racing. P.Mu SAS pads are proven in applications at world level, to run 24 hours with no pad stops. SAS871 is ideally suited to rear applications in saloon style racing such as GT Racing with excellent, consistent torque characteristics allowing the driver to be less aggressive with the brake pedal whilst still achieving improved braking forces. This means the brake package is not being punished and the driver does not need to push as hard on the brake pedal. SAS871 is commonly used as a rear pad in front-engined vehicles in combination with SAS964. These pads behave similarly through a stop, but at different friction levels.